Adorable, fun, printable saint images, crafts and more that kids love! 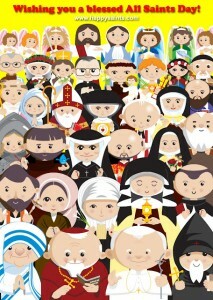 Ever wanted a great resource of wonderful saint images you can print and use as cards, for crafts, cupcakes, stories and more! Well find it all now at happsaints! This wonderful websites is sure to bring a smile to anyone face! They also sell shirts, mugs and more – find the perfect gift for 1st communions, Christmas, birthdays and more! Click here to visit Happy Saints. 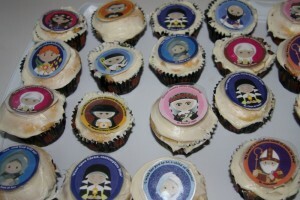 This All Saints Day – I thought it would be great to send some Saint cupcakes to school with my daughter. Happysaints.com had wonderful and fun drawings of saints that kids really enjoy. So I Printed , cut and laminated them – so now we will have them for years to come! I sent them with a book of Saint Stories which Mme. said the children really enjoyed too!